For cleaner gutters (both inside & out) and a healthier water supply. Our first priority in designing a gutter brush and spade was to keep hands safe. 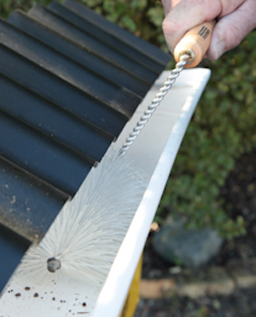 While our gutter spade should be your preferred choice for removing leaves, and accumulated dirt and sludge from the gutter, the gutter brush`s long-life nylon bristles ensure thorough scratch free cleaning inside and out. The brushhead will fit through the narrowest of openings, reach under internal gutter clips and clean the gutter floor, walls and roofing overhangs all at the same time! Seeing the brush stem is constantly coming into contact with sharp, abrasive roofing edges we have incorporated a long-reach, zinc plated, steel wire stem. The gutter brush is ideal for removing moss, lichen, algae, and dirt and bird droppings, thereby ensuring a cleaner, healthier rainwater system for those that rely on a rooftop supply. This type of maintenance is recommended by leading spouting manufacturers as it can dramatically increase the lifespan of colour coated steel gutters. For best results, and to prevent blocked up downpipes, we recommend you start off cleaning out as much as you can with the gutter spade. Once this has been achieved introduce the hose and the gutter brush - you will be amazed how quick and easy it is to get your gutters thoroughly clean.